Sorry I didn't get a chance to make a post yesterday; we were very busy. Yesterday we drove down Butare along with a journalist from Boston who is here to do a story on the genocide and Rwanda's reconciliation. Along the way the mountains gave way to wide valleys with large rolling hills. Butare is Rwanda's second-largest city and was the former colonial captial of the Belgian territory of Rwanda-Urundi. In 1962 the capital was moved to Kigali because of its central location. Butare was the largest city at the time, but today Kigali is many times larger. After walking around and having lunch in Butare, we drove another hour back north to the Murambi Genocide Center, formerly Murambi Technical School. As word of the violence in Kigali spread out, Tutsis all around the country began takign shelter in churches and the like in many towns around the country. The Hutu chief of Ginkongoro ordered those gathering at the town's church to move to the recently completed Murami Technical School two miles out of town so that no Hutus would be mistaken for Tutsis when the killing started (this chief is now a member of the FDLR in the DRC). On April 16th, French forces arrived at Murambi along with a small band of Interahmwe. The French moved into the makeshift refugee camp, which had swelled to 65,000 to take a census, telling the refugees that they were doing it for the UN to help figure out what supplies should be sent. As the French reported the numbers to the Interahamwe, the Interahamwe cut the water and electricity to the compound and sent out a call for more Interahamwe to gather around the compound. Meanwhile the UN, believing the government to be nonsupportive of the genocide and unaware of the Interahamwe surrounding the camp, continued to fend off the RPF from advancing further south. At 1:00 PM on April 21st, the French forces left Murambi as part of the foreign troop pullout agreement. By 3:00 PM, the 5,000 Interahamwe who had amassed around the compound attacked. Over two days they murdered 65,000 Tutsi civilians. There were four survivors. In mid-May when the French forces returned to Murambi as part of Operation Turquoise, the brought with them bulldozers and backhoes, along with thousands of pounds of lyme. The French covered the piles of bodies left by the Interahamwe with the lyme and then buried them in an attempt to hide the evidence of the massacre. Throughout Operation Turquoise, Murambi was one of the main French bases in southern Rwanda. Due to being covered with lyme prior to their burial, many of the bodies at Murambi were mumified. Today over 2,000 of these bodies sit on display in three of the classroom buildings at the school. The rusting cement mixers left behind by the French remain on a hill between some of the buildings. The bodies are slowly being reburied in a set of modern crypts currently under construction. Our tour guide at Murambi was one of the four survivors. He was shot in the head during the first day of the attacks and managed to escape the compound during the night between the two days of killing. The next thing he remembers is waking up in a hospital in Burundi, where he spent four months. He still lives in Ginkongoro and says his life is often threatened by Hutus in the surrounding community. Many Rwandans fear another genocide. Emanuel, our guide at Murambi is one of them. Currently President Kagame rules the country with an iron fist and is very strict about inter-tribal relations. The problems, many say, will come when Kagame dies. Many feel a hidden animosity simmers deep in the hearts of many Rwnadans and that in the power vacuum that will be left after Kagame dies, violence may again erupt. It is almost certain that the FDLR will attempt a full-scale invasion of Rwanda after Kagame is gone, and it is almost certain that the RDF (RPF) could stop them. The real question is whether or not there is enough hate left within Rwanda to rekindle the genocide. Every Rwandan that we have talked to about the issue has had a very different opinion on that matter, and very few are willing to talk. Emanuel was the most open; he says he no longer fears death and that he would be happy to die in the place where his family died, teaching about his family's death. Rwanda needs more Emanuels. The RPF is/was a militia formed in the mid-1960's by Tutsis who fled discrimination and violence in Rwanda to Uganda immediately following Habyarmana's election. In response to increased anti-Tutsi violence in 1990, the RPF invaded northern Rwanda. The civil war raged in northern Rwanda up until 1993. UNAMIR was estamblished to keep peace between the RDF (Habyarmana's government army) and the RPF (led by Kagame), as well as to help with the humanitarian crisis. In 1993 the Tanzania and UN brokered peace agreement, the Arusha accords was signed and peace came to the country. April 7, 1994. President Habyarmana's plane was shot down by a French-made missile on approach to Kigali international. The attack was carried out by Hutu Power extremeists with the suppport of the French government. These extremists were members of Habyarmana's government who were dissatisfied with the terms of the Arusha accords. It was a fals-flag operation that blamed the RPF. The genocide started that night, and the Arusha accords were shattered at the RPF smashed through the RDF lines and into Rwanda. The UN, not seeing the genocide and beleiving the story of the RPF assassinating Habyarmana, attempted to beat back the RPF while the French trained and armed Interahamwe began the killing of the Tutsis. By the time the UN realized what was going on (and the French pretended to realize it), over 1,000,000 were dead. The RPF took control of the country and chased the Interahamwe into the DRC (then Zaire). Habyarmana's government feld to Kenya, while the lower-level organizers fled with the Interahamwe to the DRC. The Interahamwe mixed in the civilians in refugee camps in the eastern DRC, living off of international aid, disguised among the 3,000,000 Rwandan civilians in the camps. Meanwhile, Kagame established his government, "cleansed" the RDF of genocidaires, and merged the DRF with the RPF. When the camps were cleared out in the late 1990s, the Interahamwe were faced with going back to Rwanda to face certain death, or to stay in the DRC. Those that stayed formed the militant group the FDLR, which is still active today. The corrupt government of the DRC did nothing to stop the FDLR, which killed over 300,000 Tutsis in the DRC. So in 2002, Rwanda invided the DRC (then Zaire) and together with other militant groups in the DRC that had wanted to overthrow the DRC governemtn for a logn time, they established a new government and fought the FDLR. However, this new government was still not doing a very good job of controlling the northeastern portion of the country, so Rwanda fought a proxy war with the FDLR through other militant groups, furthering the problems in the eastern DRC. In December 2008, Kagame reached an agreement with the DRC that he would turn in the rebel groups that Rwanda was sponsoring and Rwanda would in turn be given permission to carry out military operations against the FDLR in northeastern DRC. The RPF has been accused of looting and pillaging in the DRC in both of their invasions. They also massacred several thousand Hutu civilians in 1999. They don't do much power sharing with Hutu leaders, and thus tensions in Rwanda remain, although they are quelled by Kagame's strong police rule. Agh, much more to say, but I've got to go. I'll try and write another to finish this later today. This one's probably going to be pretty long; I've got a lot to explain. Saw President Kagame's house last night. Lots of soldiers with assault rifles guarding it. Came to the realization today that nearly every business in downtown Kigali is guarded by a security guard with a shotgun. Woke up this morning and got on the bus to the Kigali Genocide Center. The center includes a large museum similar to the Holocaust museum in D.C. There are also 15 completed mass graves, as well as two that are still open and being filled as bodies are found. There are currently 258,000 genocide victims buried at the Kigali Genocide Center. Security was tight- we had our bags searched by guards with AK-47s at two different checkpoints and had to pass through a metal detector. The museum was very enlightening and did not attempt to hide any of the west's involvement in the genocide. It was very blatant about the involvement of the French especially. There was one photo that really stuck out to me- it was of President Habyarmana and the French Prime Minister riding in a parade float next to each other waving, with the Rwandan and French flags in the background. It was from 1990. I learned quite a few new things about the French invlovement...even "we wish to inform you" was pretty reserved in its accusations compared to the stuff at the museum. Very blatant about the Interhamwe training, weapons trades, and the real purpose of Operation Turquoise. Another thing that I guess I never really understood was the full extent of the information revealed by "Jeane-Pierre" on January 10, 1994. I had always known that he had revealed the locations of the weapons caches and the general outline of the plan to UNAMIR, but I didn't know that he had also told them of the plan to brutally mutilate Belgian troops as well as the fact that the elite Hutu Power clan was no longer operating under the authority of Habiramana. Kofi Annan held a copy of the Hutu Power plan for genocide in Rwanda on January 11, 1994. Kofi Annan held a detailed copy of the Hutu Power plan to exterminate the Tutsis in Rwanda on January 11, 1994. He responded by ordering Dallaire not to seize the known weapons caches and tightening his rules of engagement. In mid April, in response to the killing and mutilation of 10 Belgian troops serving with UNAMIR, every country excepting Guinea withdrew their troops. They feared another Somalia. In May UNAMIR II was established, but they never went, because they were waiting on 50 tanks from the US that were never sent. After leaving the Kigali Genocide Center we drove to Nyamata Church, about an hour southeast of Kigali. When the first Hutu Power regime was elected in 1961 and the Tutsis were first persecuted, many were forced off of their land and on to some of the worst farmland in the country. Although Rwanda is highly fertile, this part of the country, called the Bugasara, is the worst. The source of one of the Nile's tributaries (via Lake Victoria), the Bugasara is a giant swamp surrounded by rocky hills. Although the Tutsis made up about 15% of Rwanda's population in 1994, by that time they made up around 60% of the population in the Bugasara, making it a particularly bloody place in the spring of 1994. In 1992, during one of the pre-all-out-genocidal massacres, thousands of Tutsis in the Bugasara took shelter in Nyamata Church and were protected by an Irish nun. Trying to stay under the international community's radar, the presence of a westerner was enough to keep them safe in 1992. Not so in 1994. As the genocide began in earnest in April 1994, over 10,000 Tutsis fled to Nyamata Church for shelter, thinking that they would be once again safe and with no better place to go. When the Interhamwe arrived on April 13, 1994, they found the place packed. They killed 4,000 in the church yard, broke through the doors with grenades, and killed 6,800 inside the chruch. Seven survived. To ensure death to all Tutsis, pregnant women had their bellies slashed open and their babies torn from them and killed. The Interhamwe used the altar to do this. The bloodstained altercloth remains there today, with the bullet-riddled tabernacle behind it. Today the church remains much as it was in the spring of 1994. The clothes of the victims remain in the pews, but the bodies have been moved to mass graves behind the church. The sheet metal roof is filled with bullet holes and bloodstains remain on the walls from where small children were bashed to death. Our tour guide was one of the seven survivors of Nyamata. His two brothers and both parents were killed there, and his sisters were raped and murdered at home. His grandmother is his only surviving relative. He was 9 at the time. He was knocked unconscious and fell in a pool of blood and was passed over by the Interhamwe for dead. He woke up two days later and spent 9 days in the church before fleeing to hide in the marshes with other survivors from the village. He hid in the marshes for three weeks, being hunted by Interhamwe with dogs until the RPF arrived. In the center of the church are stairs down to a crypt. In the crypt are several hundred skulls, femur bones, and a single coffin draped in a purple cloth. This coffin is given a special place of honor because of what the woman went through. She was a Hutu woman who had left her arranged-marriage Hutu husband for a Tutsi man whom she loved. She was raped over 30 times, had her child cut out from her belly, was stuck on a stake, and then had her child skewered onto her chest. It is for this reason that she was given a place of honor in the memorial. Outside by the side of the church is the grave of the Irish nun, as well as the parish priest. Behind the church are two large crypts in which 21,600 femur bones and 10,800 skulls are arranged on racks. It is easy to tell the manner of death from most of the skulls. We were permitted to descend into the crypts. We returned to Kigali and spent the rest of the day at the Iris, trying to recuperate. Tomorrow will be what is probably the most taxing day of our trip. We will leave early in the morning for the four hour drive to Butare, Rwanda's second-largest city. After spending some time in Butare, we will drive another hour to a technical college where and even larger massacre than the one at Nyamata took place. Then we will drive all the way back to Kigali. I may not have time to get to an internet cafe tomorrow. Left Ruhengeri this morning to make a few stops in the area around Kinigi, the town closest to the Verungas, on the road to the DRC. On our way out we saw two trucks of soldiers headed to the border. The Imababazi group from yesterday had seen a convoy of seven trucks full of UN soldiers also headed to the border. Hmm. We stopped at a Batwa settlement a couple miles outside Kinigi. The Twa are a race of pygmies that live in Rwandas forests. They make up about 2% of the population. We watched them perform a dance, and once again someof us joined in. After that we headed down to AIDP (Amahoro Intergrated Development Program), the "One" organization from the common basket program. We were there to drop off the $1,500 in donations from BSM, along with several bags of used books. AIDP works to unite genocide/aids widows with genocide/aids orphans. They run a large orphanage as well as build homes in which they place one widow and 5 orphans each to create new families. We visited the mainorphanage as well as two of the homes. One home can be built for $2,400. I played soccer with three orphans for about 30 minutes while the teachers met with someof the workers. On our way back to Ruhrngeri we passed a column of over 500 Rwandan soldiers marching towards the border. I would not be surprised if more Rwandan operations in the DRC are announced soon. Search "FDLR" on GoogleNews. When we arrived in Ruhengeri we found the main street packed with a wall of people and the northbound side of the divided boulevard closed. As we were sitting at lunch we heard sirens coming up in the distance. It was a professional cycling race coming through town. A member of the Rwandan national team was in third place and the huge crowd was going crazy. It was pretty cool. We said goodbye to Ruhengeri and set off for Kigali again. It was beautiful to see the Kigali skyline down below us, the city sprawling as far as we could see as we came over the last mountain. We go to Nyamata tomorrow. As part of the memorial they have over 2,000 skulls of genocide victims on display in open crypts. I'm not sure how I'll respond to that. Woke up this morning at 5:15 to see the gorillas. After an hour car ride to the national park office, we signed in and were put in a group with a dual American/Rwandan citizen who lives in Richmond. We were assigned our two rangers, who told us about the family of gorillas which we were going to see as well as about the mountain gorillas in general. Volcanoes National Park is right up against the borders with the DRC and Uganda. Both the DRC and Uganda have national parks on the other side of these borders. I use the term "national park" very loosely with the DRC, as it is really just uncontrolled wilderness. Together these parks encompase the entire Vertugas Mountains, which are a small chain of volcanic mountains, including three active ones. The last major eruption was in 2002 and destroyed most of the congolesse city of Goma, which we saw in the distance two days ago. The Vertugas Mountains are the only home to the mountain gorillas (which are their own species from lowland gorillas, which are much more common). When the gorillas were first documented in 1902 there were over 5,000. Today only 308 survive. The jungle of the Vertugas is also famous for its golden monkeys. Elephants, water buffalo, and wild boars also live there, among many species of bird, amphibians, insect, and reptiles. The group we met is called the Hirwa Group and is home to 12 gorillas: one adult male (called a silverback), six adult females, and five children. This group is only two years old. It was formed when its silverback challenged the alpha silverback of his group, lost, and was thus kicked out of his group and forced to form his own. He then went aroun challenging weaker silverbacks and taking their territory and mates until he had formed his own group. Most groups have multiple silverbacks, but since this one is so young, it only has one. We left the park office with our two rangers and piled into the back of a Land Cruiser for a half hour off-road ride. When we reached the point that our car couldn't go any further, we were met by two Rwandan soldiers armed with AK-47s and a "porter", whom I later discovered was a ranger in training. From here we hiked about 30 minutes across the fields until we arrived at a low stone wall with dense jungle on the other side. This was the park boundry. We climbed the wall and began to trek through the jungle, one ranger, one soldier and the "porter" in front, and the other ranger and soldier in back. We were told that the soldiers were there to protect both us and the gorillas from the congolesse poachers who often cross into the Rwandan park. After about 45 minutes of climbing through the dense jungle of mostly bamboo, we met two other soldiers and another ranger. We were told hat the gorillas were just ahead. Apparently there is always at least one soldier and at least one ranger following the gorillas 24/7 to protect them from poachers. We asked them how often they run into poachers and were told that there haven't been any attacks this year but that it had been very bad last fall. We found the large silverback with his five children eating and napping in a "clearing" about five minutes from where we met the guards. We spent over half an hour watching them, the kids coming within three feet of us as they wrestled and rolled around in the brush. Then the mothers came back, and all the gorillas got up to go, and we followed them as they tramped through the jungle, stopping the eat and rest very often. It was amazing to watch the giant silverback move. It was huge, probably around 450 pounds and it just tramped through everything. It was really, really fast. I got over 50 mintes of video with the gorillas. After our 60 minutes were up, we trekked back down the mountain and across the feilds to the car, and drove back to the pakr office, and then back to Ruhengeri. I think it's also worth mentioning that the military presence in this part of the country is significant. While we had seen trucks of police with shotguns and rifles in Kigali and Ruhengeri, it was very different here. In addition to the soldiers we saw at the park, we also saw multiple trucks full of soldiers with AK-47s, as well as a group of 15 or so combing a field. This is due to the fact that the FDLR remains very active in the part of the DRC right across the border. As unnerving as it is to see dozens of people walking around with assault rifles, it actually makes one feel very safe. Observation: Red Eminem shirts are really common here. Question: How does a four year old Rwandan living in a remote village 45 mins walk from the nearest road end up with a "Hillary Duff 2005 US Tour" shirt? We went to a crafts associations today in a very remote village about a two hour walk from Ruhengeri. After working our way down from the mountains into a giant valley, we walked the last 45 mins on raised dirt paths between 8-10 foot tall beanstalks. Saw another Project Rwanda bike- that makes four so far. The fgirst thing we did was make banana beer. We took mildly rotten bananas and peeled them, thowing them into a wooden tough carved from a log. After that we mixed in shredded banana leaves with the 200 or so bananas we had peeled. We then mushed the whjole thing to a pulp, forming two walls with the mush and having a pool of banana juice in the middle. We then crushed about 2 pounds of sorgum beans and added this to the pools of juice on the sides of the walls. Then the middle pool was emptied into the side pools repeatedly, so tyhat it filters through the sorgum and the leaves. After that, the juice is strained and left out in a covered jar for 3 days. After that, the banana beer is ready. We also learned how to make baskets. That was less interesting. Tonight we have a special surprise fo r the other groups. Each day, onew of the small groups has been shopping in the market for food and then cooking for the entire group. The food has been quite lackluster. This morning we went out and ordered 60 brochettes for pickup at 6:30. Yum. Everyone will be very happy, I think. By the way, I would like to recommend the film "Gorillas in the Mist" to anyone wanting to learn about Rwanda. The film is set in the late 1960s and is about Diane Fossey's attempt to save the silverback mountain gorillas here in northern Rwanda/DRC. The film is extremely accurate and was actually shot on location. The streets of Kigali, Goma, and Ruhengeri can be seen at various points in the film, and they still look mostly the same today. Additionally, in the scene where Ms. Fossey seeks refuge from militants in the DRC with Ross, that is the actual house and garden that we were at yesterday. Well, the garden and the outside of the home are the same, but the inside is decidedly different. It's nowhere near as nice as that inside. Kellen (Imbabazi curator) is Ross' successor. Ross used to run Imbamazi until she died in 2006 after 57 years as a charity worker in Rwanda. We visited both her home and grave yesterday. "Shake Hands With the Devil" and "Hotel Rwanda" are two other famous Rwanda movies. Hotel Rwanda is somewhat inaccurate, and was filmed entirely in South Africa, so it contains absolutely zero on-site footage. I suggest you watch all three. Last night after dinner all the water in Ruhengeri ran out. It came back on at around 3 PM today. According to some of the locals, the water goes out once or twice a week during the dry season. We left this morning for Imbabazi orphanage, which is in a very remote part of the country near the Congolese border. We drove an hour down a paved highway out of Ruhengeri, and then moved on to a terribly made dirt road which basically consisted of volcanic rock with some gravel to "level"
it out. On the way we saw lots of interesting things. -Groups of convicted genocidaires in pink and blue prison jumpsuits working on a drainage ditch under guards armed with assault rifles and shotguns. We also saw from our vantange point on a mountain road Lake Kivu and the Congolese town of Goma, which is the centerpoint of all the fighting in the eastern DRC. 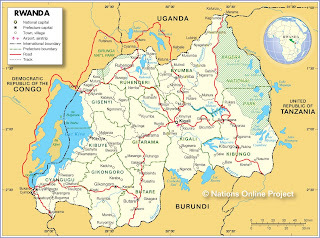 Goma sits right against the Rwandan border. The town was almost completely destroyed in a volcanic eruption in 2002, which caused the relocation of the crime-ridden refugee camps from around the city. The town remains the central hub of the arms trade in the DRC. Our guide told us we were 15 KM from Goma. At one point, we were about 4 KM from the Congolese border. At the orphanage we watched the kids learn spelling in Kinyirwandan, and then taught them some english. After about an hour in the classroom, we ate lunch with Kellen, the curator of the orphanage. Then we walked with some of the older kids up the nearest volcano and down into its crater. I have some pretty cool video of that. When we returned to Ruhengeri the water was back on, and we were very thankful. 9 of us went with Bosco to see his family and deliver donations. That went fine. Eh, everyone else is waiting for me to finish up, as per usual. Rwanda is great. I once again slept a lot last night, a solid 10 hours. Woke up feeling like I got hit in the back of the head with a brick though. Heh, bricks. I'm fine now. I think it was mostly dehydration. This morning we left in our small group of just 6 of us (Mickey, Dann, Mary, Kelsey, Ms. Overbo and myself) to go work at a brickmakers' association about 4 miles outside Ruhengeri. Greg (our Rwandan friend from Amahoro Tours) gave us a lift, after we pushed his land rover a couple blocks to get it started. The association is in a large clay quary on a bluff above a road and a swamp down below. While we were there we learned how to do all the basic jobs in brickmaking and got more than a little dirty. To make bricks, you first use a giant hoe to scrape clay from the side of the pit in whioch you're working, then as one person turns the clay, others come with 20-liter jerry cans with water from the swamp. You keep doing this until it's the right consistency. Similar to mixing mortar with dad, only we down have a mixer and we're making hundreds and hundreds of pounds of it. Then the clay mix is formed in a mold, shaped, and left out to dry. After a couple days, enough dried bricks have been accumulated to make a giant brick kiln, 6 meteres cubed, with a a small tunnel into the back, in which a fire is lit and kept burning for 20 days. After 20 days, the bricks are done. THe associations sell the bricks for 31 RWF and pays the brickmakers 5 RWF per birck the mold, who in turn pay the kids who fetch the water 1 RWF per liter (550 RWF = 1 USD) The brickmakers work 12-14 hours a day, and can produce up to 800 bricks a day. We each took turns doing all the steps, while the Rwandans mostly laughed at us. The agreed that Dann was the best a forming the bircks, while I was the best at digging the clay and carrying the water. They also agreed that Mickey doesn't eat enough. They just thought Ms. Overbo was crazy (Mizungo oya sawa sawa!). Hussan (another Rwandan friend) got some video of it with my camera. It's hilarious. We walked back to town at the end of it, stopping in some village along the way for water. The people there thought Rahcel and Sarah were my daughters when I showed them our family picture. Normally, we are greated with "Mizungo" which originally meant rich person, but has now become synonymous with white person. On the way back, we were so dirty and mudcaked from making the bricks that instead of calling us mizungo, they had some other word, which Hussan said meant "white" but not "white person". Apparently we weren't mizungo because we were caked in mud. We saw some eucalyptus and sugarcane farms on the way back in addition to the usual sorgum and bananas. In Rwanda, sorgum is used in place of wheat. We saw another member of the Rwandan national cycling team out riding. I was totally dehydrated and felt like I was going to throw up. I had four bottles of water and two fantas and I'm feeling great now. Another great thing about Rwanda: no diet pop! We had our first brochettes today, and while they were good, I was dissapointed in how similar the flavor is to beef. It's kinda a mildly tough version of extra-lean beef, with a similar taste. It was certainly great, just more mundane than I expected. One thing that I forgot to tell yesterday was that along the entire length of the road from Kigali to Ruhengeri there were people digging a ditch for the installation of a fiber-optic line from here to the capital. It was somewhat strange to see a long-distance fiber optic line being installed in a country with very few paved roads and an average income of less than 400 USD. While we had been in Kigali there had been some speculation among the more pop-culture tuned women in our group regarding whether or not the cast of the show "Lost" had been staying at the Iris with us. Apparently the group who saw the gorillas today (and had a great time!) met an actor from Lost (who also played Pippin in Lord of the Rings) at the national park office. This seems to confirm that they were in fact at the Iris with us. Going to a soccer game tonight at Ruhengeri Stadium. We met the head of the local soccer organization last night, and he invited us to attend today. Slept a solid 11.5 hours last night. Toally wiped out from going 48+ without any sleep. We left the ghuesthouse at around 10 this morning for Ruhengeri. Lucky for us, the road between Kigali and Ruhengeri is one of the few paved roads in Rwanda outside the capital. It was quite a trip. Rwanda is called the land of 1,000 hills, but it should really be called land of 1,000 mountains. The topography is ver similar to that of Colorado. The travel experience was similar to the mountain passes in Colorado was well, excepting the fact that there was two-way traffic on the roads, along withj people walking on the side. The whole country is filled with farms: sorgum, bannanas, soybeans, regular beans, potatoes, corn, cows, goats. We stopped at some sort of fuel depot on top of one of the mountains to take photos and the like and we explored some of the farms there...very interesting. We saw some of the members of the Rwandan cycling team (Jake's friend leads an organization that raises funds for them). We also saw a project rwanda coffee bike outside a mall in Kigali last night. The reminds me of something I forgot ot mention last night, and this is the police presence. It's not so much here in Ruhengeri, but in Kigali it was strange. Lots of cops riding around in military dress with rifles in the back of large trucks. We saw that a few times. The mall we were at last night had two officers, each with a shotgun, at every entrance. Kinda creepy. Anyways, Ruhengeri is much different than Kigali was. there are less paved streets, no hi-rises, the houses arten't as nice, and there is marginally less traffic. The atmosphere is considerably more relaxed as well. We went ot view the Intore dancers at Ruhengeri Stadium this afternoon, an easy walk from our hotel. It was pretty cool. Some of us, including myself, got up and danced with them. The crowd of 200+ Rwandans found that to be hilarious. You'll have to see the video when I get home. We spent the rest of the day exploring Ruhengeri on our own. It was pretty cool. We talked to a lot of people, some more extensively than others. They all want to know what we think of the country, and are very pleased to see that we are impressed. We're getting a hang of the Kinyirwandan phrases, and even learning an itsy-bitsy bit of Swahili. It's strange how people talk here, mixing Kinyirwandan, Swahili, French, and Enghlish together to varying degrees. Most people in Kigali spoke all four. Here, everyone speaks Kinyrwandan and Swahili, and most know either English or French. French is somewhat more common. Well, gotta go back to the guesthouse, everyone's waiting. Anyways, we certainly arrived safely. All three flights went fine, and the transfers were pretty smooth. I closest we came to trouble was some drunk lady who claimed to know us. She claimed a lot of things. I had my bags searched in Brussels, but the guy was pretty nice. Beautiful scenery on the way down- lots of wildfires burning in Sudan. Ah, Rwanda. What a beautiful country! Customs were quick and easy ,as was getting to our hotel. I've gotta love the street life here: hundreds of people walking down the streets, cars, buses, motos, and trucks vying for a place in traffic. We got to our hotel, the Iris Guesthouse, last night around 8. It's pretty nice. It's located near the top of one of the hills in Kigali and is pretty nice. Dann, Mickey, and I are sharing a three-bedroom unit with the four chaperones, while all the girls are off in motel-style rooms. Dinner last night was great! Traditional Rwandan food, and it turned out to be great. Vegetables, red meat, and potatoes seem to be the staple of the diet. No goat brochettes though. Didn't sleep at all last night, get-lag was crazy. Today we went to mass at St. Famille's Catholic Church in Kigali. Many Rwandans sought sahelter in churches as the genocide began, not knowing where else to go. Because of this, many of the largest massacres took plave in churches. St. Famille's, however, was an exception. The churchyard of St. Familles is within view of many foreign embassys, as well as two belgian-owned hotels. Because of this, there were never any massacres at St. Famille. We arrived at the church at about 9:30 for the 11:00 mass. In Rwanda, masses are 2 hours long. While we waited for the first mass to end, literally hundreds ofg kids, from toddlers to around 12, came out of the church and gathered in huge crowds around us. We practiced our Kinyirwandan and they practiced their English. We went in to the church at 11, and the mass really did last until 1. In Rwanda, people don't receive communion unless they have received confession since their last serrious sin. Thus, most of the congregation stayed on their benches during communion. The church was like a massive brick oven, with about 2,000 people jammed into this space, all on wooden benches. It was at least 15 degrees warmer than outside, which has been in the upper 70s but very humid. The sun is very, very strong here however. One can feel themselves beginning to burn within the first few minutes of heading outside. I luckily, have scaped unharmed. After mass, we spent the day around Kigali...lunch took 3.5 hours because they ran out of food and eventually become dinner. We just stopped in here after out stop at a grocery store to get some forgotten supplies. Thanks for all the well-wishing! It looks like the Tanzania excursion won't be happening after all. We got an email today from one of the aides to the president of the tribunal, saying that while the invitation still stands, the offer to pay for airfare does not. Apparently they thought that it was just the 4 teachers, not all 23 of us, when they offered to pay airfare. You win some, you lose some. Note: To anyone who normally reads this for transit commentary, if you don't want to read about a 17 year-old kid going to Rwanda for two weeks of cultural and genocide study, don't read this for the next two weeks. If that sounds interesting to you, by all means continue reading. If you're reading this, you got the message somehow, either via facebook or through the email I'll be sending to the family list. For anyone who doesn't yet know, I will be traveling to Rwanda tomorrow with 18 other students and 4 teachers for two weeks of cultural and genocide study. I plan on using this as a medium for keeping in contact with everyone whenever I manage to get internet access. I think that I will probably have internet almost every day while I'm in Kigali but I doubt that I will have any while in Ruhengeri. I plan on giving a relatively detailed account of what we did since the last update. I also plan on posting videos and photos on here once I get back (I've got a camcorder with me). The leaders of the trip, James Cave and Dave Kuntz, both history teachers at my school, will also be keeping a blog. You can find their accounts of their two previous trips to Rwanda there, along with an account of their brief but scary trip into the DRC. We had an exciting change of plans that we just found out about today: Our group has been invited by the president of the United Nations court for the prosecution of genociaires from Rwanda, located in Arusha, Tanzania. He has offered to fly us in, all expenses paid, on a charter plane out of Kigali. We will be doing this on either the 10th or the 16th. We leave MSP at 2:00 tomorrow, bound for Chicago, then Brussells, then finally Kigali.